Reverse Osmosis (R.O.) 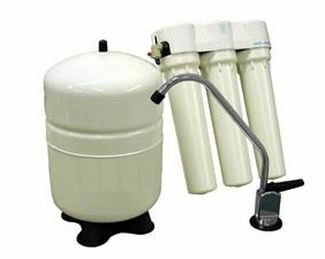 is one of the most convenient and economical methods of reducing unwanted contaminants in your drinking water. Reverse Osmosis is the process by which water molecules are forced, by water pressure, through a semipermeable membrane. Most of the impurities and other contaminants are rinsed to the drain while the refined water is routed to a special holding tank. The Microline® TFC-3 Reverse Osmosis Drinking Water System uses the latest advances in plastics technology to produce the most streamlined and user friendly R.O. system on the market. In addition, this system is validated by the National Sanitation Foundation (NSF) Water Quality Assosiation (WQA) under Industry Standard S-300-91 and by the state of Wisconsin's Department of Industry, Labor and Human Relations.